Humans have always realized that those who somehow manage to avoid procrastinating get more done. Alexander the Great is said to have attributed his military success to his habit of “never putting anything off.” And yet, for most of us–who just want to get our work done as well as clean and organize our home, not conquer Asia–the temptation to put things off is ever-present. But as strong as the urge to procrastinate can be, it doesn’t have to control your life. Developing some new habits and adopting a few small shifts in perspective can help you stop procrastinating for good. Many of us recognize that creeping sense of dread and shame when we’ve been avoiding a task for far too long and its deadline is fast approaching. It’s not just that you’re unprepared, but that you feel as if your unpreparedness is all your own fault. Procrastination can have negative consequences beyond making us feel bad about ourselves. It turns out shirking your responsibilities until the last possible moment can be destructive to your finances and mental health. 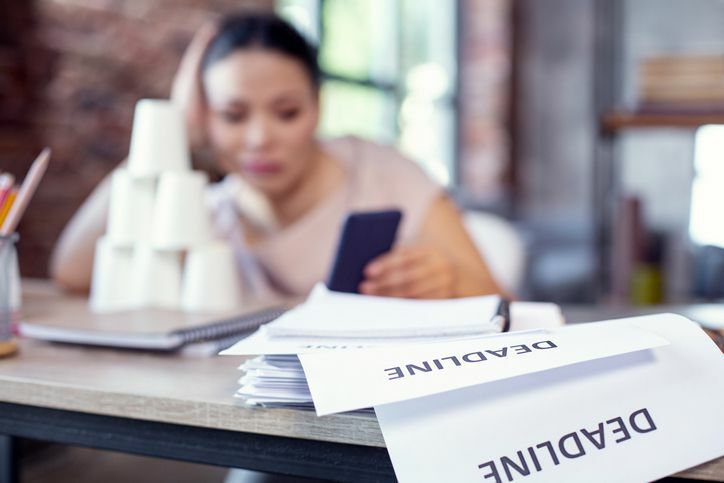 Studies suggest that workplace distractions could be costing the economy hundreds of billions of dollars, and procrastination-driven decisions like failing to file taxes in a timely manner can cost individuals hundreds of dollars. Over time, procrastination has been found to cause stress and illness. What does life look like for someone who doesn’t procrastinate? For one thing, non-procrastinators know which tasks should take priority; this is considered one of the habits of super-productive people. Not only can non-procrastinators easily identify which tasks should come first, they work to accomplish those tasks in the proper order and in a timely fashion. They use routines and tools, if necessary, to organize their homes, lives, and schedules so they can do what needs to be done when it needs to be done. They manage their time so as to minimize the hours they spend worrying about it, inefficiently “planning,” or otherwise avoiding doing what they need to do. People who don’t procrastinate don’t necessarily enjoy doing everything on their to-do lists, but they’ve figured out that getting stuff done with the least possible delay feels better and causes fewer problems for them in the end. Procrastination is very common, which is why those seemingly born without a penchant for procrastinating stick out in a crowd. It can also feel like slacking is just a part of your personality–something you can’t fight. Some studies have indicated a link between procrastination and impulsivity and found that both traits are moderately heritable. But that doesn’t mean you can’t improve your habits. Here are a few of the many practical tricks you can incorporate into your life to get things done on time. Knowing what tasks you have to do every day–and determining the optimal order in which do them–cut down on wasted time and take a lot of guesswork out of your life. It helps keep mundane chores like cleaning and making your lunch from impeding your progress on larger, more urgent tasks. Following a daily routine or a weekly routine means you have fewer unnecessary choices to make each day and less room for procrastinating tendencies to creep in. It’s a cliché that when, say, a student has to write a paper, they suddenly become very enthused about cleaning their room instead. But that cliché is a real problem, and it happens when you’re not regularly keeping up with your cleaning and organization at home or at work. You can think of this as tackling procrastination on the smallest level first. It takes little to no willpower to open your letters, sort through the mail, and throw away junk mail every day (it’s the sort of mindless action you can add to your daily or weekly routine). Once you get into the habit of doing that, there will never be a huge stack of mail waiting for you to sort through at the exact moment when you should be working on that paper. Often, procrastination attacks when a project feels too daunting. It could be a very difficult project (e.g. a paper on a topic you don’t understand) or simply a large or tedious one (e.g. a long paper on a topic that bores you). To prevent this, don’t say you’re going to write your paper on Friday, the day it’s due. Instead, plan to review the source material on Monday, write an outline on Tuesday, write a draft on Wednesday, revise that draft on Thursday and then double-check your work Friday before submitting the paper. Schedule each day’s “assignment” using your calendar or whatever method you prefer. When in doubt, assume any task will take more time rather than less. And consider the concept of “idea debt”–if you’re going to be spending time thinking or worrying about writing your paper, you might as well use that time to actually write it instead. Allow Yourself to "Procrastinate Productively"
You can let yourself procrastinate up to a point if you’re procrastinating by doing something else that truly needs to get done. If you have to write a paper for one class and read a book for another, and you really aren’t feeling the paper right now, go ahead and work on the reading first. Of course, you don’t want to completely avoid writing the paper, but when you give yourself some flexibility–making sure you have the time to do so without falling behind–you may find your most onerous tasks start to seem less awful. This trick isn’t for everyone; some will find it helpful but others will find it a slippery slope. To stay on the safe side, limit your allowances to tasks within the same category: put off work by doing other, equally important work, but do not put off work by cleaning or shopping. Give yourself rewards for working on what you’d otherwise put off. If you can manage to be mature about it, you can reward yourself in a variety of ways. One is to promise yourself that if you work until a certain time of day, you can then relax and do something fun. Another is to alternate stretches of work with stretches of fun (or mindless activity, like cleaning in short spurts). For example, two hours of paper-writing, then a half hour of TV, then repeat. You can also make working more enjoyable by adding a simultaneous treat, like buying your favorite iced coffee to drink while–and only while–you write your paper. To get the most of this method, you really have to know yourself and be honest or you’ll end up with all rewards and no progress. In a world of Twitter, Facebook, Instagram, and internet memes, it is all too easy to become distracted for hours at a time. If you know you're about to sit down and work on a big project, put your phone in another room, turn it to "do not disturb" mode or airplane mode, or give it to a friend until you finish what you're working on. Many people depend on tools like apps, planners, and timers to keep their procrastinating minds on track. One of the best known is the Pomodoro Technique, which uses a special timer to divide your day into short intervals of work and rest. You can also set a plain old kitchen timer or alarm on your phone to give yourself a set time during which you’ll do nothing but work. One very old-school tool is a simple calendar, though you can get as fancy as you like with online calendars and apps. Scheduling everything you need to do in a calendar or planner helps you visually see your workload and fights the type of procrastination that involves keeping your mind fuzzy about when exactly you need to do what. With tools, keep in mind that they’re supposed to make it easier for you. If plugging your daily activities into an app is adding more work to your day, then that’s not going to help your productivity. You may be procrastinating because you try to work, work, work all the time. Make time in your schedule for your hobbies–the things you love doing. If you never take a break, you could be more prone to procrastinate because you aren't replenishing your energy. When you’re working on ending a procrastination habit, it’s important to know why you’re putting off tasks in the first place. You can read all the tips in the anti-procrastination book (and there are thousands of such books) but until you understand your individual situation you won’t be able to apply those tips to your own life. Maybe you put off doing tasks when you find them boring. In that case, giving yourself a reward when the task is finished could help you power through. Or perhaps you neglect work when you’re easily distracted by your phone or social media, and setting a timer to block off 25-minute chunks of work-only time is your solution. If you avoid working only when the task seems overwhelming or intimidating, breaking it down into smaller steps could help you. If you simply have a poor sense of how much time a task will take or how much work is actually involved, planning out your days, weeks, and months far ahead of time and using a planner that splits the day into hour-long increments can help you map out a procrastination-free schedule. Sometimes, a serious aversion to getting things done is not a procrastination habit but a symptom of another problem. Maybe you’re not actually a lazy worker by nature, but your current job or work environment is a bad fit for you. Maybe you’re failing at accomplishing certain tasks because you’re not getting enough good sleep or you have an undiagnosed health issue that’s sapping your energy. Maybe you get a lot done but some tasks always get lost in the process–could you be trying to pack too many to-do’s into your day? Ask yourself whether you’d still be procrastinating if you loved your job, felt awake in the morning, or had fewer activities crammed into your schedule. Your answer could reveal what you need to do next to take action.